I had this amplifier built with all brand new parts, it was never hooked inline due to not having the right amount of power source. Bench tested at Mouses house using a dummy load, it will do every bit of 5KW + with the right power source. 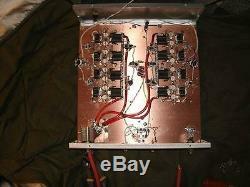 Mouse Trap 16 pill 10 meter ham amplifier with all brand new parts! 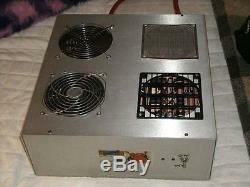 This mobile box has 16 matched Toshiba 2SC2510 transistors. 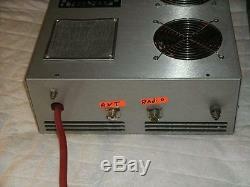 This can be ran ran at 28 volts dc and is a 24 to 28 volt maximum amplifier. This needs heliax coax to operate properly.